John Shoesmith was a travelling salesman before the war, who was called up in 1916 and killed the day after joining his battalion in the front line. John Shoesmith was born on 18 September 1885 in the Kirkgate area of Leeds, Yorkshire, the eldest son of John William Shoesmith (born 1864) and his wife Ellen Elizabeth née Waite (1866–1963). John William Shoesmith was probably born in Halifax in June 1864, and baptised at All Saints Church in the Salterhebble district. 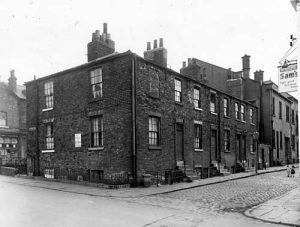 In the 1881 census, his father, also John, was the manager of a cocoa house at 57 Wellington Street in Leeds. John William, aged 16 was employed as a “cloth dresser”. John William married Ellen Elizabeth Waite at St. Peter’s Church, now Leeds Minster, on 6 April 1885. Ellen’s father, John Waite was described as a “weighman” at the time of the marriage. The couple’s first child, John, was born at 2 Cadman’s Court, Kirkgate, Leeds on 18 September, some five months after the marriage, and baptised at St. Peter’s on 20 December 1885. A second son, Alfred was born on 25 February 1888, but died in March 1890, shortly after his second birthday. Nine months after this tragedy, a daughter, Annie May was born on 23 November 1890. At the 1891 census, the family were living at 6 North Hall Terrace in the Burley area of Leeds. (North Hall Terrace was swept away in the slum clearance of the late 1950s.) John William was a tailor’s cutter and Ellen was a self-employed milliner. Two more daughters were born in the next three years, but both died before their second birthday. Nellie was born on 22 March 1892 and died in the summer of 1893. Edith was born on 23 January 1894, but died in March 1895. After losing three of their first five children in infancy, happily the next two children survived into adulthood. Harry was born on 2 April 1895 followed by Doris on 11 November 1896. Shortly after the birth of Doris, John William seems to have abandoned the family and disappears from the records. (On the service records of Harry Shoesmith, there is a declaration signed by Ellen on 12 May 1919 about her husband’s whereabouts: “Not heard of for over 20 years”.) Ellen was now left to raise her four surviving children on her own. In the 1901 census, Ellen and her four children were now living at 10 Hanover Street, a short distance from North Hall Terrace. Ellen now described herself as a “milliner, travelling” and as an employer. 15 year old John was now employed as a “wholesale clothing warehouseman”. By 1911, 45 year old Ellen, now describing herself as a widow and a self-employed milliner, was still living in the Burley area, now at 3 Claremont Terrace, off Hanover Square, with her two daughters. Harry cannot be traced on the census, but John, now aged 25 was employed as a “commercial traveller, milliner” and was lodging at 48 Narbonne Avenue, Clapham in south-west London at the home of Alfred Rowdon, a lawyer’s clerk. By 1914, his younger brother Harry, now employed as a warehouseman was also lodging at the same address. John subsequently moved to Sussex and by early 1916 he was living at 11 Stafford Road, Brighton. On 19 February 1916, John Shoesmith was one of three men who were initiated into Knights of the Road Lodge No 3673, meeting at The Royal Pavilion in Brighton. He was passed to the Second Degree on 15 April and raised to the degree of a Master Mason on 27 May, by which time he had enlisted in the army. Knights of the Road Lodge had been consecrated on 19 June 1913 and the majority of its members at this time were commercial travellers. John’s Grand Lodge certificate was issued on 19 June 1916, but it is doubtful if he was able to attend further lodge meetings in view of his military service. The two brethren initiated with John Shoesmith were 26-year old art teacher Clarence Mackenzie and 43-year old life assurance manager James Parkhouse. James George Parkhouse (1873–1953) was the District Superintendent for a life assurance company. In late 1914, his eldest son, 17 year-old James Harold Parkhouse enlisted in the 3rd South Downs Battalion as Private SD/2760. On 30 June 1916, now Lance Corporal with the 13th Battalion, Royal Sussex Regiment, he was killed at the Battle of the Boars Head on what became known as “The Day that Sussex Died”. In the absence of his service records which have been lost, there are few precise details of John Shoesmith’s military service. In late 1915, he enlisted in the 2/1st Sussex Yeomanry, whose Brighton squadron headquarters were at Church Street, close to the Royal Pavilion. In April or May 1916, he transferred to the infantry and joined the 4th (Reserve) Battalion of the Royal Sussex Regiment, with service number 5007. In October, he was posted to the British Expeditionary Force in France and transferred to the 13th Battalion (with service number G/16474). A draft of 135 O.R. arrived for duty. The draft for the most part came from the 5th and the 9th Battns R. Sussex Regt and were a very satisfactory lot of men. The 13th Battalion had originally been raised as the 3rd South Downs Battalion by local MP Claude Lowther, and, together with the 1st and 2nd Battalions, were known colloquially as “Lowther’s Lambs”. On 30 June 1916, the three battalions were sacrificed in a diversionary raid on the Boar’s Head salient at Richebourg-l’Avoué, about 20km north of Lens. In the battle, the three Southdowns battalions lost 15 officers and 364 Other Ranks killed or died of wounds, with over 750 men wounded or taken prisoner, and the 13th Battalion was nearly wiped out. 30 June 1916 became known as “The Day Sussex Died”. The 13th Battalion had over 170 men killed on 30 June 1916, but was gradually rebuilt. By September, it had moved south to the Somme and was involved in the fighting on the Ancre on 3 September and at Thiepval Ridge at the end of September. Shortly before John joined the battalion, it was involved in the capture of the German trenches at Thiepval known as the Schwaben Redoubt and Stuff Trench. These battles caused further heavy casualties and between the start of July and the end of October, a further 130 or more men were killed. Battalion moved to huts in Martinsart Wood. Working party of 250 O.R. was supplied for work on the Authuille – Mouquet Ferme Rd. Work proceeded satisfactorily till about 1.30pm, when a hostile aeroplane flew over and shortly afterwards the road was shelled. Battalion regrets the loss of 4 killed and 2 wounded. 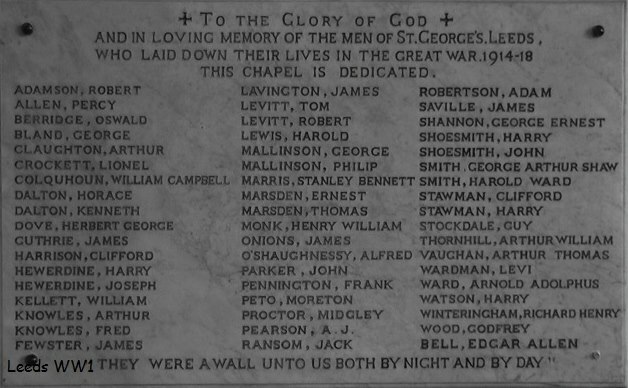 The other men killed with John Shoesmith were G/16401 Walter William Bailey (aged 41), and brothers 20-year old G/16471 George Frederick Newnham and 27-old G/16470 William James Newnham, the sons of Son of William and Elizabeth Newnham, of 14 Marmion Road, Clapham Common. Like John, they had enlisted into the 4th Battalion, Royal Sussex Regiment at Brighton in the summer of 1916 and transferred to the 13th Battalion. The three men were recruited together, trained together and, sadly, were killed together. The bodies of the four men were not recovered and they are commemorated on the Thiepval Memorial which records the names of over 72,000 British Empire soldiers who were killed in the Battles of the Somme who have no known grave. 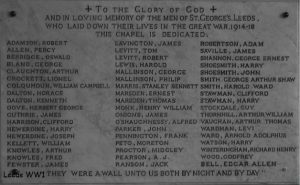 Apart from the Masonic Roll of Honour, John Shoesmith is commemorated on the war memorial at St. George’s church in Leeds city centre. 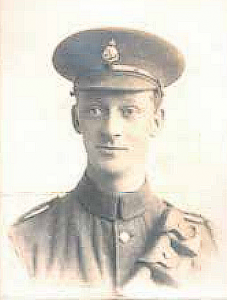 John’s younger brother, Harry enlisted at Clapham Common on 14 September 1914, joining the 23rd (County of London) Battalion, the London Regiment as Private No 2910. He was sent to France with the battalion on 24 June 1916. On 2/3 October, the battalion took part in the Capture of Eaucourt l’Abbaye, 26 km south of Arras, during which five men were killed, 83 wounded and 75 missing. Harry was among those wounded and he died of his wounds on 11 October and is buried at Becourt Military Cemetery, near Albert. John and Harry’s mother, Ellen, had now lost three children as infants and her two surviving sons in the war, as well as having been abandoned by her husband. Despite this, she lived a long life and died in Harrogate in the West Riding of Yorkshire in 1963, aged about 97. Wor. Bro. Mike Beningfield for extracts from the registers and minute books of Knights of the Road Lodge No 3673. The members of the Great War Forum, especially “kenf48” for help in understanding John Shoesmith’s military history. North Hall Terrace: Leodis – a photographic archive of Leeds.